Inside a Texas Longhorn – what is in there? Texas Longhorn producers who are involved in the meat business know every bite is chucked full of great nutrition. Cattle association’s elected leaders have discussed for years the actual ingredients in those Texas Longhorn muscles. Normally Texas Longhorn meat marketers just do a ‘shoot-from-the-hip’ analysis from some historic unknown test. Here is where it came from and here is the answer. During the eighties a pen of steers were fed that were Hereford and Hereford/Longhorn crosses. The TLBAA funded this feed lot test. As I recall a committee put the test together. It cost something over $30,000, but the sale of the steers, after being grain fed, was more than the test cost so the final outcome was either a wash or close to it. The Hereford steers were all tested for fat, carbohydrates, protein, etc. The half Longhorn steers were also tested for the same exact nutritional data. The difference in the data became the published ingredients that have been used for about 30 years. At the time I was on the committee and pushed for a pen of straight Texas Longhorns, but I was out voted. It was believed the gain would be so bad on straight-breds the results would look bad. Some very good things came from this test, but not good enough, especially to stand up with today’s serious health conscious consumers. Since that time it has been discussed to do new tests, but with all costs considered, each effort by an association has fallen short. Skipping forward to 2009 — Longhorns Head to Tail store, a ranch retail outlet at Dickinson Cattle Co, Barnesville, Ohio developed a heat and serve grass fed beef product to target health and provisioner food buyers. Before a USDA approved product could be developed the ingredients had to be determined by an official lab certified by USDA for the label. The label had to state exactly what was claimed in the container. The label data came from 15 pure Texas Longhorns, all grass fed. Eight 28 oz cans of different critters were all blended together at the laboratory. Not only was the basic nutritional facts determined, but Omega 3 was also tested. In the last dozen years Omega 3 has been discovered to be a treasure of multiple health benefits. Although more has been written on Omega 3 than any other ingredient, the USDA does not require Omega 3 to be a part of the label. Every other ingredient is required by law to sell a food product. The USDA 2010 Dietary Guidelines for Americans recommend that adults get 8 or more ounces of oily fish (salmon, trout, sardines and anchovies) per week. This level of intake should provide about 250 mg per day of omega-3s, a level that has been shown to reduce cardiovascular disease risk, reduce cancer, reduce risk of osteoporosis, preserve muscle, should also help maintain healthy body weight and healthy bones. This recommendation corresponds to three fish meals per week. The label above shows the nutrition facts on a large sampling of Texas longhorn trim meat. This data was approved by the USDA as an official ingredient label for the LHTT Heat and Serve roast beef product. And……….. wow! Notice the Omega 3 is officially 1.45 grams per 3 oz serving – about the size of 4 ice cubes. Once this ingredient data was scientifically proven, the exact same nutritional facts apply to Longhorns Head To Tail jerky, summer sausage, hot dogs, grind, etc. To push this wonderful data one more step, the LHTT all meat hot dogs have as much or more Omega 3 than farm raised salmon. 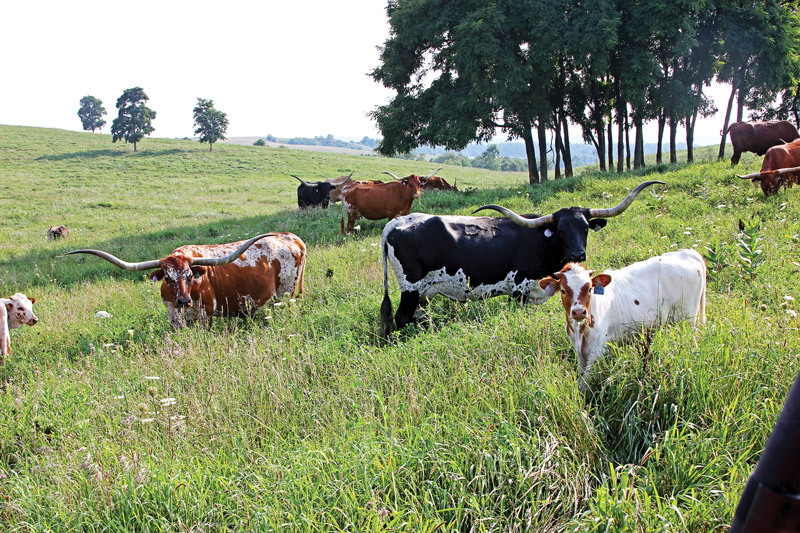 Although grazing grass values may vary, most Texas Longhorn cattle should have roughly the same ingredients as the LHTT label. Could the USDA possibly be wrong pushing a heavy fish-for-health diet? Could be? Not only that, there are many other deceptive, not so healthy foods. Google Omega 3 and learn the high and low percentages from vast testing of different meats. The Omega 3 will not be part of a Certified Angus Beef label — ever. Many consumers think most meats are a good source of Omega 3. However, when food animals are fed a heavy grain diet, the Omega 3, which is mostly developed from rich grasses, goes away. Chicken, pork, turkey and feed lot beef is almost zero Omega 3. The most tender juicy steak probably has very little or no Omega 3, is lower in protein and higher in carbohydrates than Texas Longhorn grass fed beef. And, that is a fact! 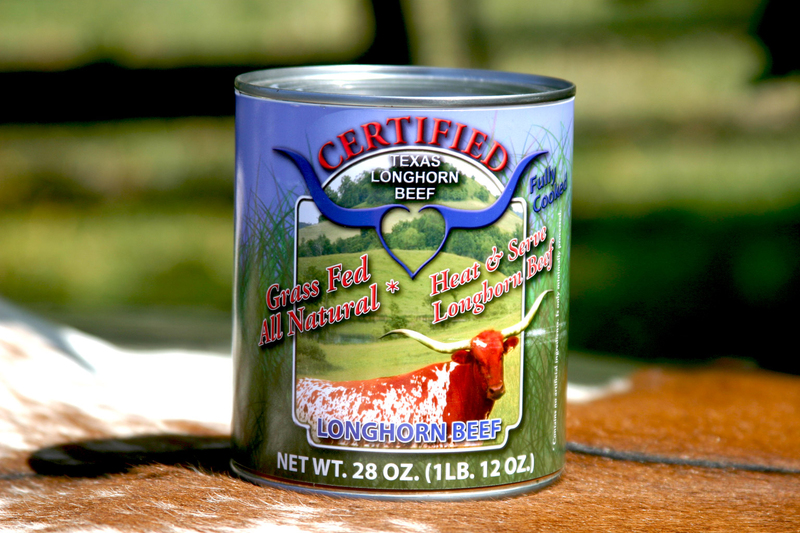 The main product Texas Longhorn meat marketers sell is grass fed grind. It is a great product with no bone, minimal fat, no waste and great food value. No one removes big chunks of fat, bone or gristle from grind and leaves it unconsumed. This great grind product is often compared to the price of chicken. This is just wrong. Here is why. A whole chicken is 27 to 32% bone, 12 – 14% skin, 5 – 8% fat. Chickens are fed a high percentage grain diet from hatching-day with nutrition comparisons not even close to Texas Longhorn grass fed beef. Pork and turkey are roughly the same low nutritional values. Texas Longhorn beef could be the healthiest, most economical, efficient, food product on earth. And that is a fact — whether the USDA knows it or not.